Last week was our annual Advent Gathering, which brings together the extended JVC Northwest family for an evening of food, fellowship, and a prayer service. 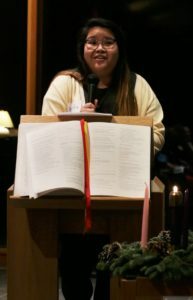 Read Jesuit Volunteer Ursula Magsayo’s (Portland, OR ’17-18) reflection, and find a link to Jesuit Volunteer EnCorps member Mary Kleffner’s (Portland, OR ’17-18) below. Incarnation. Fully human and fully divine. We are all made in the image and likeness of God. These are the words we remind ourselves as the season of Advent comes upon us. Our Savior is to be born in a manger in Bethlehem where 3 Kings shall give him gifts of Gold, Frankincense, and Myrrh. Gold, to represent divinity, Frankincense, to represent Jesus’ willingness to become an offering to God, and Myrrh, to represent suffering—the suffering Jesus went through to save us. During the Advent season, we are reminded of the coming of Christ. This is a time of intentionality—a time where we can look at ourselves and the 2017 year and ask: where is God in all this? Where has God been? Where is God to come? This is the time to reflect upon the past, look at the present, and hope for the future. But as we enter into a new season, I find myself asking: where do we find God in this bleakness of Winter? How do we see our world as charged with the Grandeur of God? Where do I find Ignatian Spirituality in the world now that I have left my undergrad bubble? When I came into this year of service, all I knew of Ignatian Spirituality were the words I have read and countless hours of reflecting upon my life. I knew that if I truly wanted to live out all those life-giving concepts, I would have to step out of my university bubble into the world I had been reading about for so long. We learn about incarnation and how Jesus is God incarnate on Earth. Jesus is God in the flesh. Jesus is God and God is Jesus. I am You; You are Me; We are two in one being. Now, I currently serve at POIC+RAHS (Portland Opportunities Industrialization Center and Rosemary Anderson High School) at the Transitions Center where I serve at-hope youth with education and employment opportunities. I continue to say ‘at-hope’ after I went to a Kids at Hope training to create a language to help us explain strengths and not frailty. Our youth are individuals like each and every one of us looking to live and thrive in this world. Our youth have goals, they have dreams, and they’re human like each and every one of us. But, we’re here not to change these youth. We’re here to meet them where they’re at and help them find what they’re searching for—their aspirations, their dreams. We’re there to help them make their next steps. We don’t go to their job for them, we don’t do their homework for them. They do the hard work. We just supply them with what they need. That’s what we’re there for. We’re here to make relationships with people; We’re here to meet people; We’re here to be transformed—not transform them. It is about leaning into the unfamiliar and immersing yourself into the lives of those we serve because it is there where we find the incarnation. It is there where we realize that we are one and the same. As I continue to get to know the youth that walk through our doors, I find my world being painted in different perspectives because of them. I feel more real and more alive. I have a tendency to buffer myself because of the constant faces I meet day to day, but that’s what the world does to us sometimes. Sometimes we become robots as we continue our day to day routine making us less human, but these conversations I have with these students really ground me. They remind me to be where my feet are at, and they remind me of who I am as we bond over certain experiences or hobbies. And in those moments, my authentic self peaks through and the beauty of human relationships really shine. It is through the people we serve where we see God, and it is through the people we serve that we are able to see God in our own selves. It is because of inner freedom, the freedom and boldness to choose God’s calling, that we have decided to serve. Advent and serving, I believe, are synonymous terms. As we prepare for the coming of Christ, as we continue to look for Christ and prepare ourselves, we find ourselves serving. We prepare for our next participant to come through the doors and help them make their first steps. We see God in them, we see ourselves, and we are transformed. We prepare, we look forward, and we serve. To read Mary Kleffner’s reflection, click here.